My mom thinks this vegan stuff is just a phase. Just as I go through other phases in my cooking, she tried to rationalize. She explained that first I was into cooking Japanese after my trip to Japan (all those soba noodles, Janet! ), then Middle Eastern after visiting Turkey and Moroccan after my trip to Morocco. Each time, I venture into new cookbooks, find new spices, but truly, I incorporate everything I learn into all my meals. New ingredients, new flavours and new techniques.. it is all a learning process, as life should be. And yes, my pantry continues to gather new and exciting staples. Granted, I can only eat so much, so I might tackle different cuisines in spurts. A little of Morocco here, a side trip to Brazil here, a quick jet to Egypt and then returning back to Japan. In these around-the-world culinary experiences, sometimes I forget how much I like certain ingredients. Case in point: miso. Last year, I bought miso for the first time to make baked eggplant with miso, which I adored at restos and could easily make at home. I also made miso-crusted black cod and a few other dishes which were great but then I went to Turkey… and forgot about miso. Until, I made a Japanese winter stew with a miso-based broth. That kick-started it again. Loved it. It wasn’t the star of the meal, but it added an extra dimension. Then I made the orange-beet soup that had an extra twist from the miso. Followed up by the exquisitely delicious zesty orange cashew spread, I knew I had rediscovered an old favourite ingredient. I made this for Rob’s birthday, which had a Japanese-theme for his meal, and I loved it as an Asian spin on hummus. 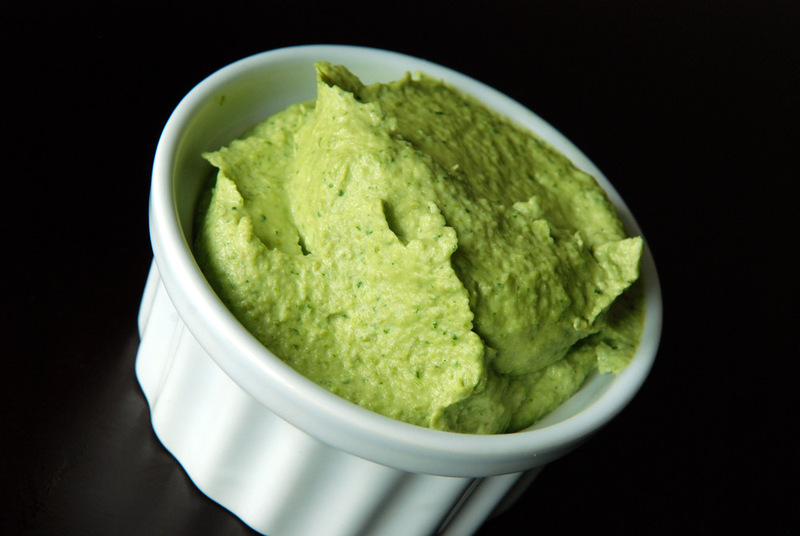 You use creamy edamame instead of chickpeas, but you still have lots of garlic and tahini for the prototypical hummus flavour. Instead of traditional lemon juice, lime juice is used. Throw in some spinach for some greenery, and you have a healthy, delicious dip. 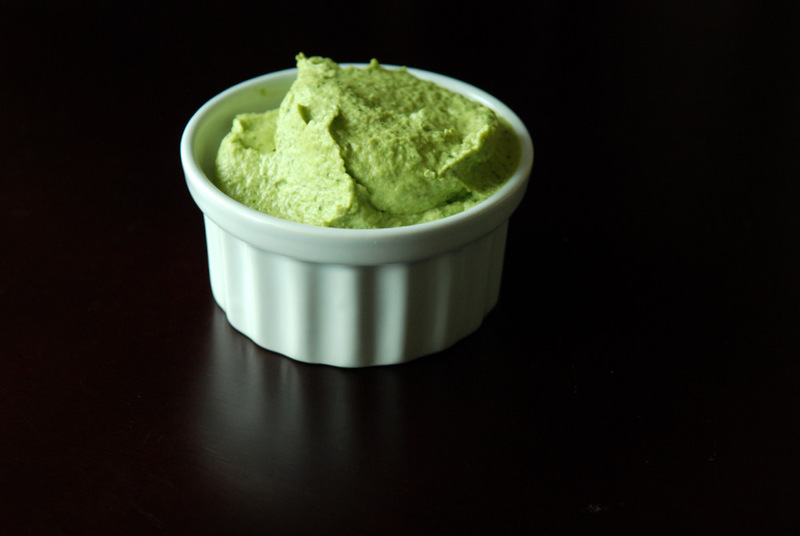 It is not just a hummus made with edamame. I had the Trader Joe’s edamame hummus after eating this dip and was sorely disappointed – where was the miso? It is creamy, smooth, salty with a bit of zip. Without knowing the ingredients, it is hard to place the flavours exactly, but you know it tastes great. Serve it with veggies, pita bread, or as a spread for a sandwich. This is my submission to this month’s Veggie/Fruit A Month, featuring spinach and to this month’s Simple and in Season for May. 1. Bring a pot of salted to a boil. Once boiling, add edamame. Cook until al dente. Not mushy, but still with a bite. Drain and set aside. 2. 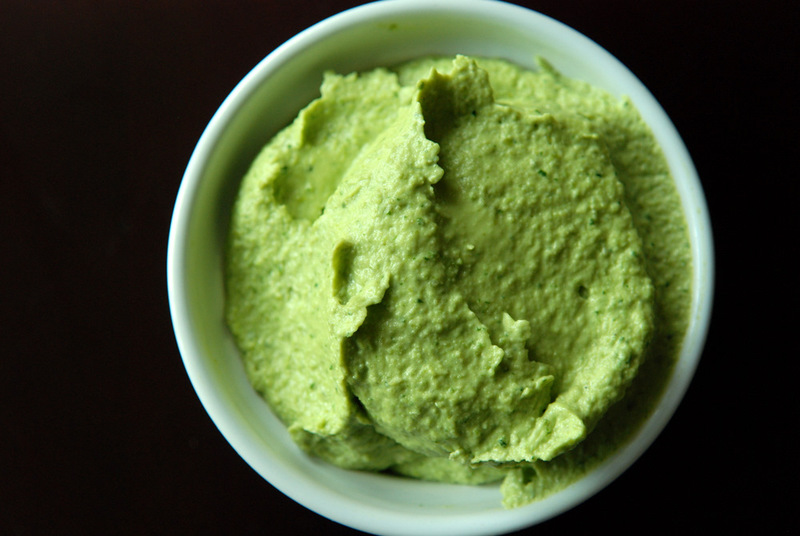 In a food processor, blend the edamame, miso, tahini, oil, garlic, and spinach very well until totally smooth. This may take longer than you might think, but should be easier if you have cooked your edamame. Blend in the lime juice and salt until the mixture is consistently smooth. 3. Remove the dip from the food processor, using a rubber spatula if necessary. Place it on your serving dish and scatter the sesame seeds on top. Serve with crackers and carrots for dipping. I have never tasted edamame – but I love spinach! Your photographs give me a hankering to give this recipe a try. This dip looks perfect for my making-every-guest-happy snack dinners! Beautiful colour! i feel like eating your photos! I also have had many different cuisine stages in my life, there was the Italian, the French, then the Chinese cuisine… When I discovered the Japanese cuisine I quickly realised this would be the love of my life, even though my meals are very eclectic and I haven’t abandoned Chinese, Italian or French cooking! Apart from its obvious sophistication and addictive ingredients (such as miso…), the Japanese cuisine is mostly very healthy and low-calorie, which in my case is very important! I’ve been wanting to make edamame hummus or edamame guacamole for some time now. The soybeans have great protein and nutrition stats. I like adding them to tacos and salads. Thats a fabulous,healthy dip, simply inviting..
Miso is one ingredient that is sorely absent from my kitchen! I need to get my hands on some! This dip sounds delicious. Miso is totally one of my favourite flavours ever. I lived in Japan for 2 years (rural countryside!) and miso always brings me back to the feeling of warmth in the depth of winter. I agree about phases, but I could never leave sweet white miso in the fridge for a year, I eat the stuff directly from the packet! This reminds me I need to buy more miso! I really like the look of this especially as your photograph is so good. I’m going to have to try it without the miso though (don’t think I can get it in Dubai) – might have to tinker a bit. This looks so good Janet! I love edamame and can’t believe I haven’t tried making this yet. Sadly, I cannot eat spinach (or beet greens or chard). Is there a green you can suggest I substitute? Yum yum. Nice and zippy but with a great richness from the tahini. I don’t think it’s going to last long around here! Yes, you need to remove the edamame from its pod.